The Galaxy tops Ford's minivan range. The current model is pictured. LONDON -- Ford of Europe will start sales of its new-generation Galaxy large minivan this year as part of a product offensive that includes the launches of its Vignale upscale trim line and new Mustang sports car. The product push reflects "a more emotional and upmarket vision for Ford products in Europe," Ford of Europe CEO Jim Farley said in a statement. The new, seven-seat Galaxy will top Ford’s minivan range, one of the largest offered by any automaker in Europe. The latest, fifth-generation Galaxy is based on the same CD platform as the new S-Max large minivan and new Mondeo midsize model. The three vehicles are being built in Valencia, Spain, after Ford shuttered its factory in Genk, Belgium, which built previous generations of the models. As with the current minivan, the Galaxy will be a roomier version of the sportier S-Max to appeal more to business buyers such as taxi fleets. The engine lineup will match that of the S-Max, a Ford spokesman said. The Galaxy and S-Max along with the C-Max and Grand C-Max compact minivans and the B-Max subcompact minivan, give Ford a wide minivan range in Europe. 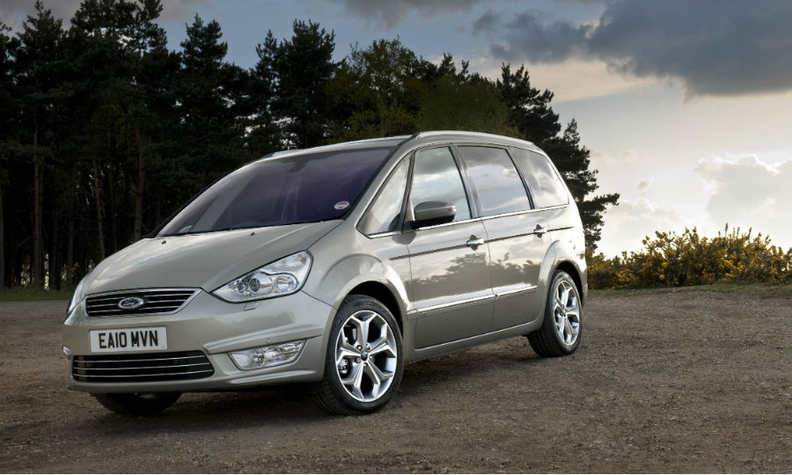 With the S-Max and Galaxy, Ford has the biggest share of the Europe’s large minivan segment. European sales of the S-Max were 30,444 through November 2014, while Galaxy sales were 18,085, according to figures from JATO Dynamics. Europe's best-selling large minivan over the same period was the Volkswagen Sharan with sales of 31,179. Ford’s other European launches this year include the Mondeo, which for the first time, has gasoline-electric hybrid variant and Ford’s new Vignale upscale trim line. The Mustang sports car will also be sold in Europe for the first time. Ford sales rose 5 percent to 947,951 in the EU and EFTA markets last year in line with the overall market, keeping the brand’s share at 7.3 percent. Ford’s third-quarter pretax loss in Europe widened to $439 million from $182 million. The company has said it will not achieve its previous target to turn a profit in Europe this year.